Without realizing it, we think a lot about our dogs’ sleeping habits. We buy them fancy beds (but typically tend to let them sleep in our own), and laugh at the silly positions they find themselves in as they doze off. We even take them on long walks to get out their energy and jumpstart that afternoon nap because, as much as we love them, sometimes it’s nice to get a few hours off from fetch, belly rubs, and barking at the neighbors. But what’s actually going on while your pup is catching those Z’s? And how much sleep should he really be getting? Let’s take a closer look. How much sleep does a healthy dog need? This varies depending mainly on the age and size of your pooch. A standard adult dog will spend roughly 12-14 hours a day sleeping. Older dogs require more sleep because their normal daily routine simply tires them out more than their younger counterparts. This is similar to why larger dogs also need more sleep than smaller breeds. Puppies sleep a ton – upwards of 20 hours a day! – because while they’re awake they are hyperactive and constantly exploring and learning new things. What do their sleep patterns look like? Sleep is broken into two distinct phases for both humans and dogs: REM and NREM (rapid and non-rapid-eye-movement). You fall asleep into NREM, but restorative sleep – the kind that truly allows you to “recharge your battery” – is REM. The issue is that while humans spend 25% of their sleep in the REM cycle, dogs experience REM only 10% of the time. Additionally, dogs are “flexible sleepers,” often jolted awake by any number of sounds that indicate an activity they’d like to take part in (a ball bouncing, a can opener whirring, a leash jingling). For both of these reasons, they require far more sleep than humans to reach a sufficient level of that restorative REM sleep. What’s with all the weird/adorable positions dogs sleep in? As with many other strange or silly dog behaviors, their sleeping positions are vestiges of their past as wild animals, specifically as it related to their security. Curling up in a ball nose to tail, for instance, was to protect their vital organs from predators, as well as to better fit into the rest of their sleeping pack as they kept each other warm. When they sleep on their side, their organs are exposed but they can also pop up pretty quickly and be ready to run or fight. Plopping down on their belly gives them the best combination of organ protection and general readiness, while the silliest looking variation – lying flat on their back with their legs in the air – is the exact opposite and can indicate a sense of comfort with their surroundings. Since safety is pretty much guaranteed for domesticated dogs, their sleeping positions will likely vary naturally and may not directly indicate how secure they feel. Still, it’s definitely possible that an anxious pup is more likely to sleep in a “safer” position, particularly if he finds himself in a new situation or in the company of strangers. Yes! Just this morning my dog told me about this crazy dream he had that involved a squirrel, a pigeon, and a pizza crust on the sidewalk. But actually, studies have shown that dogs likely dream in a similar way as humans, meaning they dream about events that happened in their day. 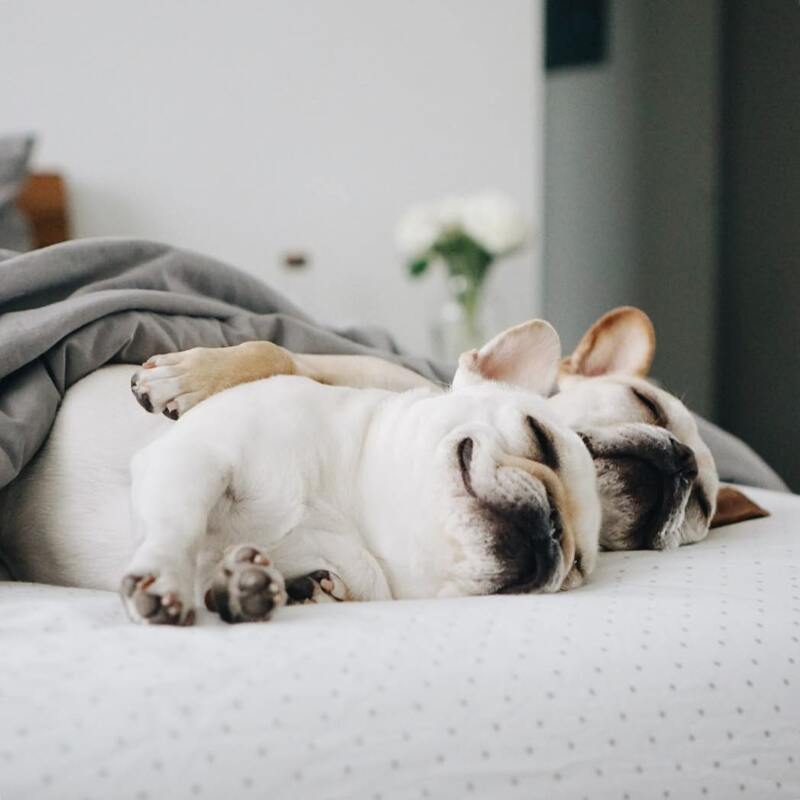 In addition to simply reading brain waves and watching their eyes dart back and forth during REM sleep, scientists have taken their investigation of canine sleep patterns a step further. When a REM cycle begins, a part of our brain called the pons activates to paralyze our limbs, ensuring we don’t act out our dreams and hurt ourselves. In lab settings, researchers deactivated the pons in sleeping dogs and witnessed physical movements that indicated dream activity. Sleeping Pointers, for example, went on point and Springer Spaniels darted back and forth, as if flushing a flock of birds from a meadow. Sweet dreams, doggies. Like humans, every dog has quirks and idiosyncrasies that can apply to his sleeping behavior and preferences, as well. As long as those routines remain consistent and sit somewhere in the normal range for a dog of his age and size, then just let that sleeping dog lie. And while he’s dozing, please do your part and set up an Instagram account so we can continue documenting dogs’ collective penchant for looking hilarious when they’re snoozing. It’s basically science.